Today we not only see top 10 time management tips but I have discovered some extremely useful & best ways to manage your time. The mastering time and money management skills is essential for creating financial success. What strategies do you use to managing your time at work is also an important factor to improve time management skills. Getting some time for themselves from the busy schedule has become almost impossible for the professional blogger. But there is no option unless & until they become capable of hiring writers for them. Everybody complains that they don't get enough time. Being flexible is great, but skills in planning and time management will help you achieve your goals. The funny fact, they wish if there were 48 hours in a day instead of 24. But we know the fact, those who succeed also has the same amount of time. Being a time organizer, the difference is they know how to manage the time & feels like 24 hours are more than enough for them. They break the shackles, step forward & succeed. 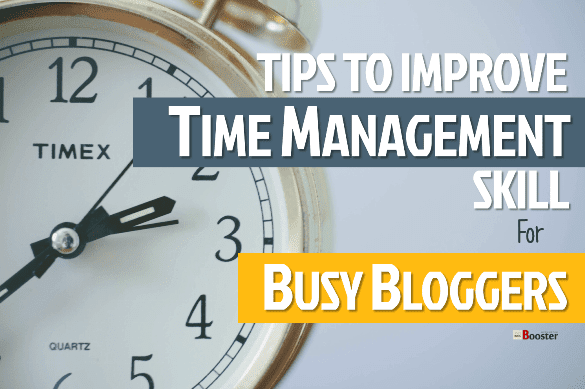 So here are some time management tips for those professional but busy bloggers, which will highlight the areas where most of the time usually get spend. It is much essential for better productivity to choose right time management techniques for work to meet its specificity and to get the advantages of time management. The purpose of this article is to encourage you to be active, attentive, and productive in your busy schedule of blogging journey. Implementing the right time management skills and tips can help you get more organized and it'll improve productivity. The more of these skills you learn to manage, the more that you'll get done each day. Last time you have seen; its a most reading life-changing articles in problogbooster. And in addition to that, today I am going to share some time management tips with you that will help you to motivate you and assist you to archive your goals with better time management. As long as you put more time into your blogging, the more successful blogger you gonna becomes, and the more successful you are going to be in blogging, the demand of time goes increasing. Whether blogging is your career or part-time work as a blogger you need to go with various blogging tools to use for saving time and for better time management process. Here is the list you can do to best manage your time. 1. Set smart goals to manage time (TARGETS). It is pretty easy to say set your goals, but simultaneously you need to maintain it throughout. Know exactly what your goals are, when & how you want to complete it. Don't set too big goals in the beginning. Enjoy completing small goals at the start which is better than giving excuses that we do when finding ourselves unable to finish the big goals. Rather it will prepare you for the big tasks. The basic problem in setting big goals initially is, if you fall short to complete it, it induces a negative thing in mind that if I could have done a bit more hard work the things would be been different. So go for the short initially. Scheduling your work is always the best way to balance your life. Bloggers generally work from home which makes it easy for them to schedule their work according to their time of productivity. Someone may get productive thoughts early in the morning, someone in the evening, etc. The bloggers have the freedom to the time to work when they are most productive. If you feel fresh & fruitful at 7 am then choose it as your working hours so that you can make complete & proper use of your energy. You don't have to tell yourself to work. When you start feeling lazy after working for some hours, take rest & start working at your next peak productive time. 3. Make a powerful To-Do list. When you get bored of your work & think to take rest, you can worth your time by doing some other tasks, e.g., cleaning of your room, as the rest is defined as the change in work. So to worth your time you have to make a to-do list. It is fair to make a to-do list, but it is too fair to make a 'not-to-do' list also. Note down the things you need to avoid & that may be your bad habits. It will save your time which could be spent on those unnecessary things which are so unproductive. Make a list before going to bed to avoid the confusion next morning. This will give you a clear idea about your day's working. 4. Manage time & set priorities. Once you make a list of all the tasks to be done, categorizes it according to their importance or the level of urgency. This will give you a clear idea about which task should be done first & which should be delayed. Obviously, the most important task to be done with first priority & going down with this to the less important task at the end. The reason behind doing this you are full of energy, in the beginning, so you will be keen & ready to go and maybe because of this you will be more productive in the beginning. Working from home allows you the option to work according to your own time & no doubt everybody loves this, but that may give an invitation to distractions. Therefore to save yourself from this, it is necessary to set some time limit to every task you have to complete. As you have scheduled your work that means it's you who have to set the deadline also as the discipline is the key element for bloggers. Setting a deadline is needed to push yourself to complete the task in time. You have to do it for yourself because there is no other boss than you over you, so be honest with it. 6. Have something to note down your ideas. Nobody knows when & which idea will strike our mind. Any idea can come at any time even when you are in the bathroom. Don't be shy that's true. Most of us find that many useful ideas come when we are off work. Like when we are talking with someone, taking a walk, eating, enjoying a function, etc.off the work, etc. It's a human tendency. When we sit to write sometimes we get blocked (writer's block). Nothing strikes our mind & that happens. But when we are off the work a load of ideas keeps striking. I am not saying that all these ideas will be relevant to each other or relevant to the topic you are thinking recently. But I must say these thoughts will be helpful at some point of time for your topic. So note them whatever & however they are, don't lose them. Don't think about the relevancy. I must say it is another job of a blogger to save those ideas for the future. Every idea will be useful to some of your topic. It is not possible to remember all those ideas & remind on time. Therefore it's better to keep a notebook or something like an app in which you can save those. 7. One task at a time. We think multitasking can save our time as we try to do more tasks at a time but that can be the reason for your distraction. Doing two or more tasks at a time splits your efforts, energy & concentration, so there is a fear of all the tasks remain incomplete. Because unknowingly you are providing incomplete efforts, energy & attention to all the tasks. It's beneficial to do one task at a time so that you can put your 100 % by focusing all your efforts, energy & strength at one task. There will not be any confusion which you may have to face while multitasking & also there will be relevance to your work. So work on a single task so as to improve your work quality. Instead of going for multitasking you can complete the single task faster & then go to the next, once it is done. The brain needs to relax to release the pressure/stress. A break is necessary to relax the mind. During break as the pressure releases due to the relaxation, it gets the time to rebuild itself for the next session, and that helps to regain creativity & productivity. So Taking breaks at regular intervals is pretty much important to relax and re-energize mind to let it result in more creativity & productivity. Avoid continuous working, take breaks in between as per your requirements. Rest yourself at least for 15 -30 minutes after completing your task. But be sure you take a break only after your task is completed. Don't leave your task incomplete in the mood for taking a break. Don't let it be the reason for your distraction. That is the most important thing you must remember. 9. Don't skip your meal, take it on time. While working, we don't remember the time & unknowingly (sometimes intentionally due to workload) we skip the meal. To work we need energy, to produce energy body needs glucose & that comes from the meal. When we stay empty for a long time, the sugar level which is supposed to be the fuel to run the body decreases & every organ is affected if it is not circulated in the required amount. And again on an empty stomach, there will be more bile in the stomach which may produce acidity. And adding extra to injury, it results in a headache. Whatever we do, we do it to fulfill our hunger. To work o an empty stomach may not hurt you today, but it may create some serious health problems in the future. So don't try to ignore the meal. Take it on time. Give a place for a meal in your to-do list. Just make sure you don't eat at the desk & don't ever dare to skip a meal. 10. Keep your focus & remove distractions. Writing needs more concentration. Once you are in it, the words start to flow naturally. But just a small distraction & you are out of it. Once you get distracted, you will lose productivity & that derails you from producing great content. Removing all distractions before starting your work allows you to stay focused & productive and that is what a blogger requires to create great content. So put your phone in silent or busy mode, log off all social networks, turn off the tv, close emails so that they don't disturb you in between your work. 11. Outline: work smarter, not harder. Creating an outline of your task is one of the best ways to overcome writer's block. It makes it easy to write your content in a proper way. There will be relevancy & consistency in your writing. Therefore the readers will enjoy reading content. Reduces efforts. It's like a plan of a building, once you created it then you only have to raise the lines up over. So whenever you think of writing a topic, start thinking with an outline in mind, it helps readers to understand your content better. As like you have scheduled your work, try to create a content plan too. It's like a calendar where you should mention the posts you want to write and the date on which you want to publish it. You should also include the promotional strategy for every post you want to publish. When you have a plan in your hand, you can work accordingly which will help you to stay productive consistent in creating & publishing your content. Editing is essential & critical for creating great contents. But it is not that much fair to do writing content & editing it at the same time as bloggers suppose. Checking the grammatical mistakes & making sure the commas are in place unknowingly wastes time. The worst thing it can break the flow of thoughts if you constantly keep editing and that disturbs your productivity. Therefore it's far better to let the thoughts flow and focus on writing first & then give some time to edit it at the end. After you are done editing, it's time to fact check, add tags & photos that are complementary. This way you can save the time & concentrate maximum on your writing. One night I completed all my writing, editing & I was about to publish. Suddenly I planned to publish it the next morning. Next morning I woke up with a surprise that all my work had disappeared. I was just one button away from publishing the content last night and suddenly........... Since then I got the lesson to back up my blog every time. Because most importantly it waste the time and it is not possible to get the same thoughts & create the same content. So bring in a backup strategy to save your efforts. We generally look at the comments & social shares to know how well our content is performing. This is guesswork & you may need to look at more formal analytics. To implement, a Google Analytics to your site is a very good solution over this. Here you can find the most liked & shared content by your readers. To get the maximum work done in short time, you have to increase the working hands for you. This can be done by hiring peoples to write for you. This way you can get the 100 hours work done in 24 hours & that will save time for you. The motto of this post is to save the time that everybody of us spends (waste) unknowingly. If you are a blogger, you will know how hard but necessary it is to maintain the quality & consistency in short span. Now you know the additional areas where your time wastes which you can save & worth it by using it for promotion, marketing & reply to comments.